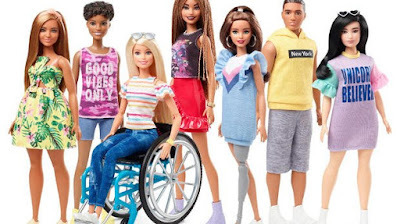 Toymaker Mattel has now introduced a new and inclusive range of their icon Barbie doll -- which now comes in a wheelchair and has a prosthetic leg. Mattel, which makes the popular doll, introduced the newest member of its Barbie Fashionista line-up, which features dolls with disabilities as well as different skin tones, hair textures and body types. Mattel made waves in 2016 when it first released a new Barbie line-up in four sizes -- original, plus tall, curvy and petite. For the new Barbie, the designers worked with wheelchair experts and the UCLA Mattel Children's Hospital. The company also worked with 12-year-old Jordan Reeves and her doctor to create a doll with a removable prosthetic limb. Reeves started a Change.org petition nearly three years ago to get American Girl to make dolls with limb differences.